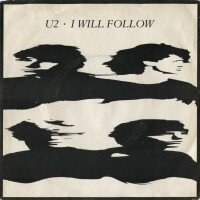 “I Will Follow” was the first U2 single to be released worldwide, up until that point the band had just released singles in Europe. It was the bands first single in New Zealand, Australia, the United States and Canada. And its been released as a live single multiple times in the years since 1980. It is perhaps the single that has been released the most by U2 over the years and this time we are looking back at the release. 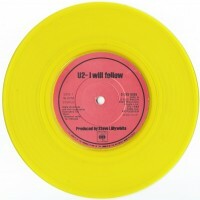 The original release of “I Will Follow“ was October 24, 1980. Yes, that’s 36 years ago today. The single was released shortly after the album Boy in the UK and Ireland to promote the album, and to offer a low price gateway into the album. The initial version of the single contained the title track, the same version used for the album. As a B-Side, U2 included a live recording of “Boy / Girl” a track that was not available on the album. That version of the song had been recorded a month prior at The Marquee in London during a live performance there. The cover of the single featured Peter Rowen, looking off to one side, with his arm across his body and holding his shoulder. The back cover featured four images, one of each band member. The single was pressed a number of times in Ireland, by CBS records. Early pressings featured an orange / yellow CBS label known as a sunburst label. Later pressings would press the vinyl with a red label either with black text, or with a white CBS logo. Re-pressings of the vinyl were also done in multiple colours of vinyl and copies exist in yellow, orange and white vinyl. There is also reports of this release in brown vinyl, which may have been due to a flaw in the colour when pressing white vinyl, or perhaps an issue of aging in the white vinyl when left in contact with the PVC wallet these were shipped in for “4 U2 Play” for too long. (The coloured vinyl were often displayed outside of their covers in direct contact with the PVC wallet). In the UK two versions are known to exist, one with a punch out centre and one without. The single was also released in Australia and New Zealand. In both cases it was released in a generic sleeve and contained “Boy/Girl” as the B-Side as did the UK pressings. In both countries it reached the chart, peaking at #71 in the Australian ARIA charts. In New Zealand it peaked at #34 on the RIANZ chart on August 2, 1981. This chart date suggests the single was released later in these territories, possibly in early 1981 instead of in 1980 as it had been in the UK and Ireland. 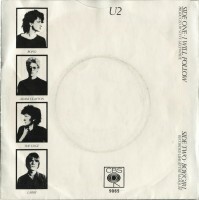 In March of 1981, U2 would release their first single in the USA and Canadian markets. 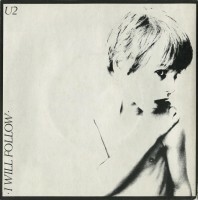 “I Will Follow“ was released there on March 17, 1981. The album Boy had been released on March 3, 1981 in those areas, and again the single was released following the album. For these markets, U2 released the single with a different B-Side than that used in the rest of the world. The B-Side in North America was a live version of “Out of Control” recorded on March 6 in Boston MA. Pretty quick turn around from recording the live song, to finalizing the single and having it in stores only 11 days later. The cover was changed for the North American release. In the UK, the album and single were released with a shirtless image of Peter Rowen. There was worry that this would not be acceptable for the North American market, and Bruno Tilley and Sandy Porter worked together on a new design for the cover for Boy. 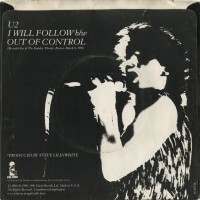 The finished cover for the North American album was used on the “I Will Follow” single as well. (We recently interviewed Sandy Porter about the creation of this alternate cover, that interview is available here.) The back cover used an image of Bono performing live in concert. In September 1982, “I Will Follow“ was released as a live single in the countries making up Benelux and Germany. (Benelux is the merger of Belgium, the Netherlands and Luxembourg, and Island records would release singles for all three countries at once.) 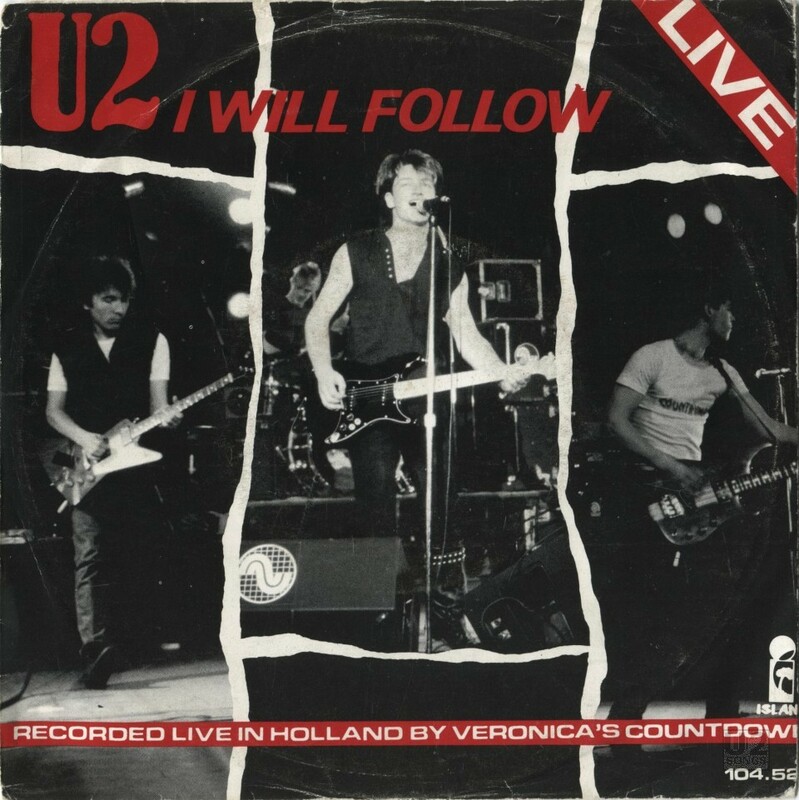 On May 14, 1982, U2 had performed a concert at T’Heem in Hattem in the Netherlands and performance was broadcast on TV by the station Veronica as part of the Countdown program. The show created significant interest in the band. To capitalize on this, U2 elected to release a single from the performance, choosing “I Will Follow” from that night’s set list. It was released with promotional material making mention of the Countdown program in order to draw audience interest. 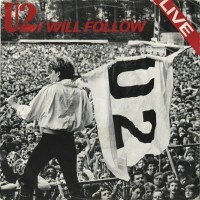 The idea paid off, with “I Will Follow (Live)” peaking at #12 on the Dutch charts on October 2, 1982. The single was also released in Germany at the same time. On the artwork for the German single, the red bar on the back cover announcing “Recorded live in Holland by Veronica’s Countdown” was blacked out so it could not be read. The single was popular enough in Benelux that at least three pressings were done. The first two were on the Island Records label which contained the tree image. On one pressing the information about producer is above the centre hole, and on another this information is below. The third pressing of the single was done on a blue label, and no longer mentions Benelux, so may have been a later pressing done for The Netherlands only. The German single did not use a paper label on the single, but instead used a painted molded label. In 1983 to promote the release of Under a Blood Red Sky, “I Will Follow” was released again as a promotional single in the USA on both 7-inch and 12-inch. But there was also a commercial single released. 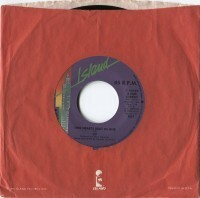 The single was pretty plain, and used the Island Records purple “city” label and was packaged in a generic red Island Records sleeve. 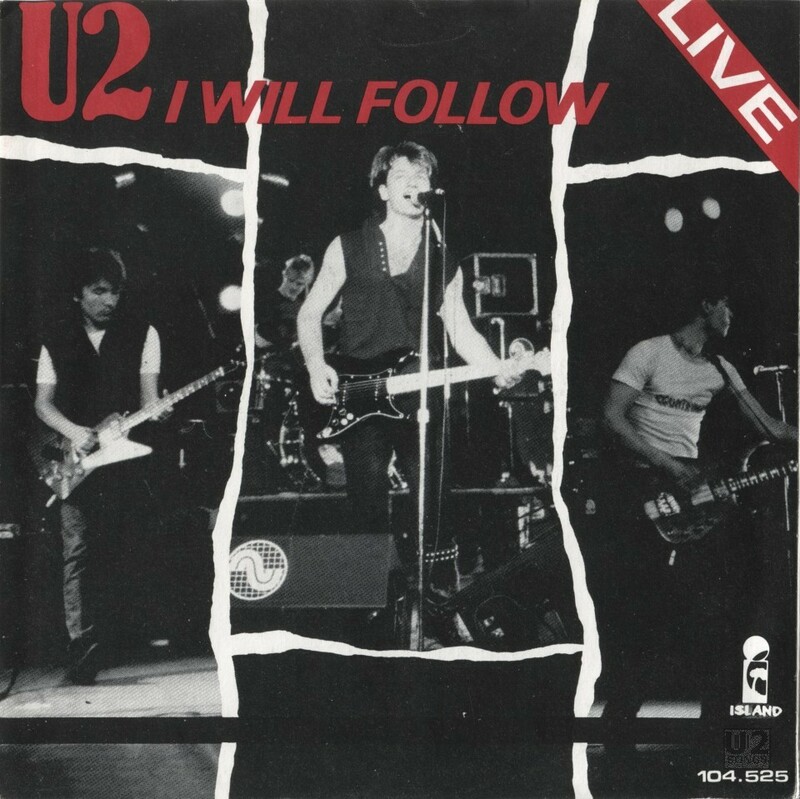 The A-Side featured the recording of “I Will Follow” from St. Goarshausen in Germany from August 1983 which had been used for the Under a Blood Red Sky album as well. The version used on the single is edited so that the crowd noise fades in at the start and out at the end. Some of the radio promotional releases took this further, mixing out some of the crowd noise to make the song more palatable for radio play. Despite Island Records’ promotional push behind this live version of “I Will Follow,” MTV chose, for the most part, to ignore it. Instead, “Sunday Bloody Sunday” from the U2 Live at Red Rocks: Under a Blood Red Sky video was placed in the network’s rotation in late 1983. 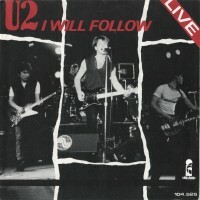 The live version of “I Will Follow” did make it to the Billboard Hot 100 on this release, reaching #81 on January 28, 1984. On June 25th, 2011, the day after U2 had performed at Glastonbury, “I Will Follow” from that performance was released on iTunes as a single for download. 100% of the proceeds from the download were donated to charity and these were split between Glastonbury’s three officially recognized organizations, Oxfam, WaterAid, and the Greenpeace Environmental Trust. Originally it was announced that the track would only be available for 30 days to support these charities, but the single was available for a number of years before finally being taken down. Sales were strong enough on the release of “I Will Follow” that the song entered the UK charts at #78 on July 9th, 2011. 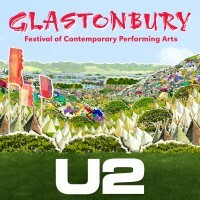 The record label listed for the charts was “Glastonbury Festival”. We do have a promotional video for “I Will Follow“ listed in our archive. 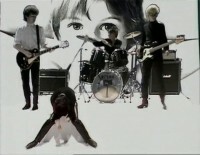 It is a simple video with U2 being filmed in a white room, and an image of Peter Rowen being added into the white areas through a special effect. The entire video is a performance of the song in studio. The video was initially filmed for promotion and was not aired on MTV in the US market as a video. “Gloria” was the first video to get play in the US markets. “The Best of 1980 – 1990” video release lists this as having been filmed in London England with no credit for the director. Some sites list this as having been filmed in Dublin with Meiert Avis which contradicts the information on “The Best of 1980 – 1990”. The credits on the video on that release list just “Island Records, 1980” where other videos clearly list a director. If anyone has any additional information where this video was actually filmed, and by who we would love to hear from you. But regardless of where it was filmed or by who, we include it here for your enjoyment.